The earliest known civilization in Mesoamerica is the Olmec and is considered at the “Mother Culture.” It appears they are the genesis of most of the aspects of the Mesoamerican cultures. The form of their government, pyramid-temple building, writing, astronomy, art, mathematics, economics and religion became the basic template for succeeding cultures. 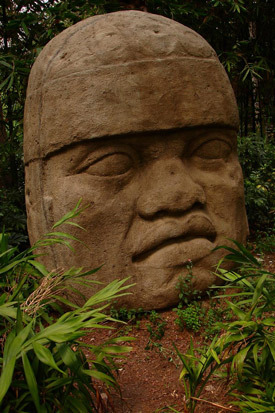 The questions of where the Olmec received their inspiration and knowledge, not to mention the required force, to create the Mesoamerican culture is rarely examined deeply. Some believe there is a connection to Africa, perhaps to Egypt. The Maya appear to have taken up culturally where the Olmec left off and fully developed the written language and further developed the calendar, art, architecture, and mathematical and astronomical systems. This was largest city in the new world and had more than 100,000 people at it’s zenith but the ethnicity of the inhabitants has never fully been clarified. It is possible Teotihuacan is a multiethnic state. 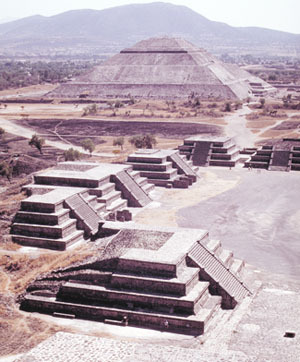 The culture and architecture of Teotihuacan was influenced by the Olmec people, but the more curious is the pyramid structures as the layout of the pyramids at Teotihuacan is the almost the same as the layout of the great pyramids in Giza. Also, the Pyramid of the Sun site atop a sacred cave which most likely determined where they placed the pyramid. The cultures of Mesoamerica that developed the most from the Olmec beginnings were the Toltec, Teotihuacan and the Mayan. Others like the Aztecs (Mexica) appear to have come from the north then imitated the culture. Still their outer cultural imitation was absorbed and became part of them. By the time the Spanish came to the New World most of the cultures then existing were in decline. What cultural elements kept them alive and what ones became literal and thus contributed to their decline?